Home » WOD Blog » That time again! EIE Challenge Post Party Today at the Venice location from 3-7pm! 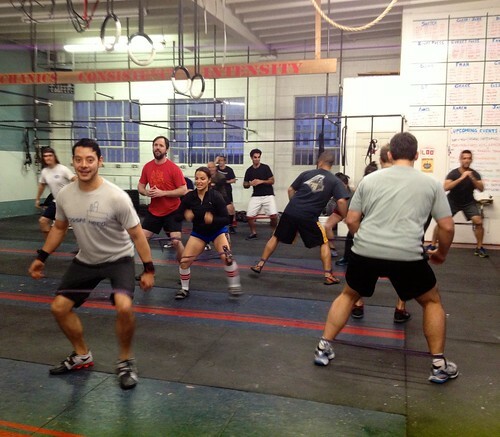 Attend the Base Camp class at 9am at Venice for something a little different! Sign up for the Lifting meet at 4pm today! Notes: Be sure to watch the videos! There are 2 rounds of each exercise. For the first round perform an easy variation and attempt a harder variation for the second round. Return to the previous variation if form breaks down. Notes: The idea is to add weight each set up to heavy singles. Do not go so heavy that you fail. Notes: Two bars and two HSPU standards may be used. This is a difficult effort but includes plenty of rest. Do not pick a HSPU scale or a weight on the power cleans that stop you from moving through the round with intensity. For some of you this will mean regular pushups! This looks like waaaay too much fun! If you can’t tell, I’m excited and fired up for these new exercises. This monday will be the beginning of our discussion on gymnastics and more independent work at home. Body control aka gymnastics is foundational to all the lifting that we do and when we get into it, you will notice that there are similarities to the prehab work that Steve has us doing. One basic objective that we will be working towards is for everyone to be able to perform a handstand. I was talking today about how I have always wanted to have a gym full of people that could just kick up into a handstand on command. Then we realized that today would be the perfect day to at least give that a try! I hope you all come out to the EIE post party today to celebrate the ending of our Challenge, the Open, making Regionals, all of your hard work and the community that we have created…or at the very least, maybe to see a hundred people attempt to perform a handstand at the same time! See you there!